Aiming to support its members, PECB has designed a program that affords discounts for PECB professionals. Prior to explaining the manner in which the discount program is applied, first the certification lifetime must be thoroughly explained. An issued certificate is valid for three years after the issuing date. When renewed after three years, the certificate will enter its second cycle, and then after another three years, when renewed will enter its third cycle, and so on. A certificate cycle is reiterated every three years, thus enabling the certificate renewal. The first iteration of this process is called Cycle one (C1), the second iteration is called Cycle 2 (C2) and so on. Moreover, the certificate renewal fee of a previous cycle (C(n-1)), omits the first annual maintenance fees of the next cycle (Cn). Cycle 1 – AMF and CPD are required for the first five (5) certificates. Cycle 2 – AMF and CPD are required for the first five (5) certificates. Cycle 3 – AMF and CPD are required for the first five (5) certificates. Once a member has paid an installment (Year 2 CPD and AMF/Year 3 CPD and AMF/Renewed the Certificate/s) of a specific cycle (Cn) for five different certificates, that particular installment will waive the fee for all the other certificates a member may acquire. More specifically, if we assume that a member has paid CPD and AMF1 of Cycle 1 (C_1) for five different certificates, then for all other certificates, CPD and AMF1 of Cycle 1 are omitted and the member does not need to pay. 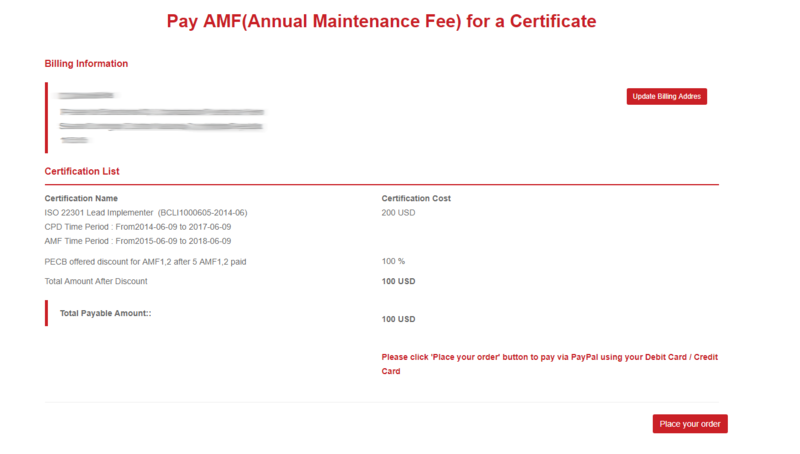 Nevertheless, that member will still have to pay installments for CPD and AMF1 of another cycle, e.g. Cycle 2 (C2). It must be stated that members with discounts will still need to go through the process of submitting the CPD and payment, with the only difference that in the payment page the members will be offered discounts for the payments that discount is applicable. The payments not included in the discount will still have to be paid for any regular payment. Another case is when you are paying for three years, consequently three AMFs, but your cycle of payments for AMF1 and AMF 2 has been reached. You will have to pay only to enter into a new cycle. 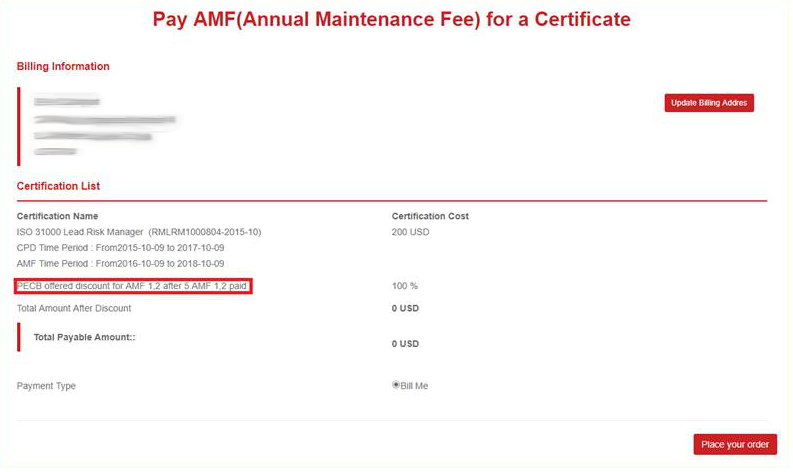 AMF1 of Cycle 1 is omitted when AMF1 of Cycle 1 (C1) is paid for five different certificates.